Okay bakers, I could not be more excited to share this cookie recipe with you! 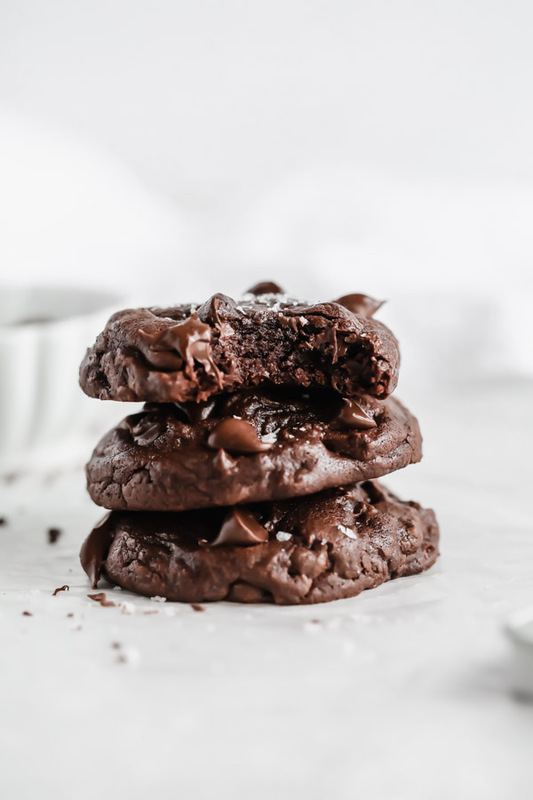 This ultimate melt-in-your-mouth cookie is near and dear to my heart because it’s literally chock full of chocolate goodness. You all know by now how much I adore all the chocolate things and this cookie just might be at the very tippy-top of the list. 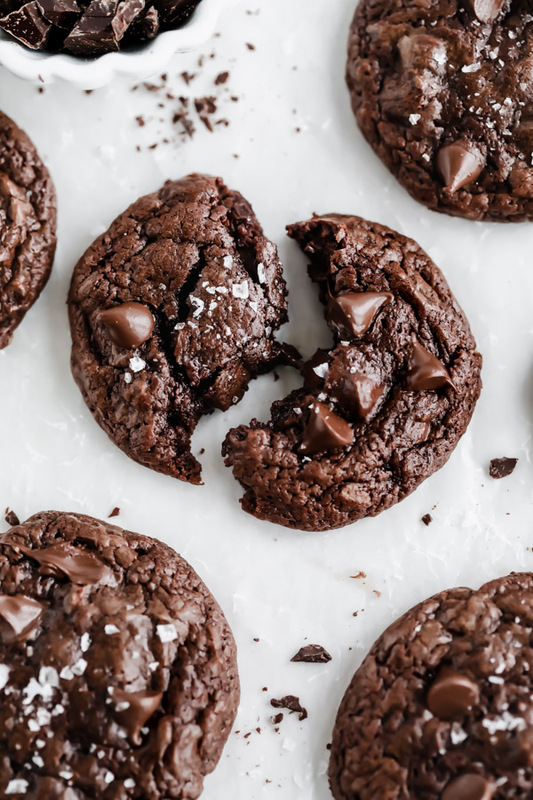 These Wanna-Be Brownie Cookies are big, chewy, soft and ridiculously delicious!! I know I say this a lot but there are seriously not enough adjectives in the English dictionary to describe just how good this cookie is. This cookie is loaded with three kinds of chocolate. Yep! You heard that right!! THREE kinds of chocolate. We are not messing around here folks. If chocolate is the question, these cookies are the answer. Not only are they incredibly good, but they are easy to make, keep well and freeze perfectly. Look no further for your new favorite cookie! 1. Don’t skimp on good quality chocolate. This rule holds true for most recipes, not just cookies. But it is important to note that quality chocolate makes all the difference, especially in this Wanna-Be Brownie Cookie which is the definition of chocolate decadence. Splurge on the good stuff people. It matters. For this particular recipe I used Valrhona for the chopped chocolate and Guittard for the mini chocolate chips. 2. Do use butter and eggs at room temperature. Ok, this cardinal rule is tough for even me to follow. Sometimes you just want a cookie and you want a cookie NOW. Softening the butter and watching the clock while the eggs warm up to room temperature takes time and trust me when I say I’m the least patient person in the universe. Not kidding. Just ask my mom. But room temperature butter and eggs are the key to cookie success so don’t cut corners. 3. Chill your dough. I know, I know…more waiting. Sigh. But again, this step will help to guarantee that perfect batch. Will your cookie be ooey, gooey, warm and delicious right out of the oven if you skip the chill factor? Yep. Sure will. Will it be puffier, hold its’ shape better and be even more delicious if you allow your dough to chill first? You betcha! Not all cookie recipes call for time in the fridge or freezer, but if the directions call for it, consider it a non-negotiable. One last tip…never, ever, ever over mix your cookie dough. Only mix until the ingredients are barely combined and little bits of flour remain. The reward will be a soft, fluffy, crazy delicious cookie that you cannot get enough of. Just like these Wanna-Be Brownie Cookies that I am currently obsessed with. I cannot wait for you to see for yourself how insanely decadent this cookie is. Now that you have this drool-worthy recipe and three tried and true cookie tips in your back pocket, let’s go make some cookies! 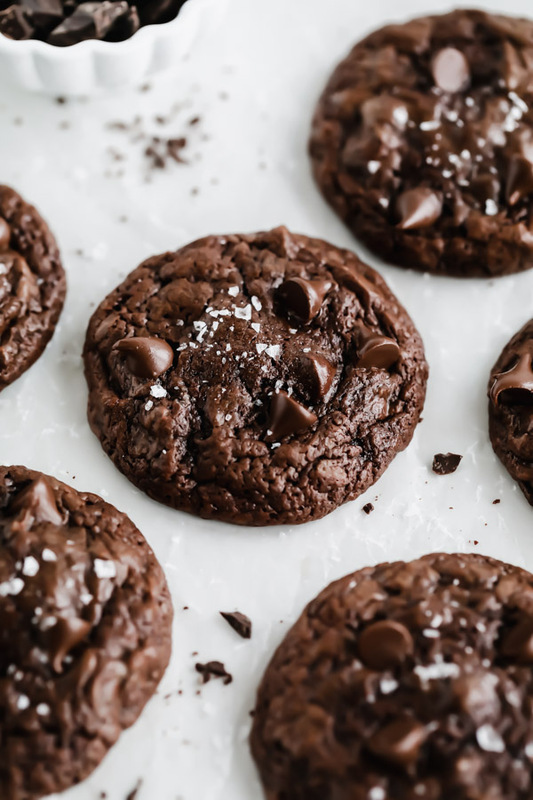 I hope you make these Wanna-Be Brownie Cookies soon and if you do, be sure to tag @brownedbutterblondie on Instagram so I can see what you are baking up in your kitchen. 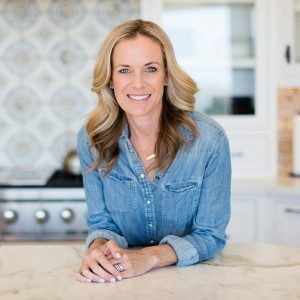 And don’t forget to follow me on Pinterest to get all the latest recipe details. I’ll see you back here next week with another must-bake recipe. Until then, happy baking! 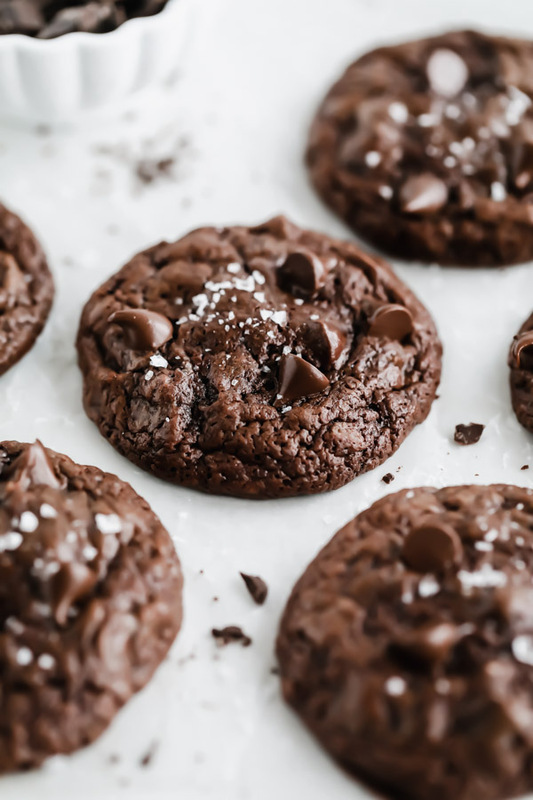 A rich and ultra fudgy cookie that is super chocolatey and totally irresistible right out of the oven. These wanna-be-brownies are soft, chewy and packed full of flavor. Absolute heaven for any chocolate lover! In a bowl over a double boiler on low heat, melt together semisweet chocolate, unsweetened chocolate and butter. Stirring frequently. Remove from heat once chocolate has melted. Do not overheat. Stir to be sure all butter and chocolate have melted. Set aside. In the bowl of an electric mixer, cream together eggs, espresso and vanilla until combined. Add the granulated sugar and mix on low until thick and creamy. In a separate bowl, sift together flour, baking powder and salt. Whisk to combine. Add the chocolate mixture to the egg and sugar mixture and blend on low speed until combined. Add the flour mixture gradually and stir until ingredients are barely combined. You should still see some bits of flour in the batter. The batter will be thin, similar to cake batter. Gently fold in ¾ cup of the chocolate chips, reserving a ¼ cup for the tops of cookies. Let dough sit at room temperature for 10 minutes before you begin to scoop dough. Scoop dough two TBSP at a time and roll into uniform balls using your hands. If batter is too sticky, use cookie scoop to form balls. Place cookie dough balls on cookie sheets, 6 per sheet. Press 4-5 mini chocolate chips on the tops of each cookie ball. Bake at 325 degrees for 10-12 minutes, until edges are set but center of cookie still looks slightly under-baked. Remove from oven an sprinkle with flakey sea salt if desired. Allow to rest 3 minutes on the cookie sheets and then remove to a cooling rack to cool. If you do not have an espresso machine, strong coffee may be substituted. Cookies keep well tightly covered and stored at room temperature or in refrigerator. Cookies freeze well, tightly wrapped. Place cookies in a warm oven directly from fridge or freezer to reheat. *Recipe adapted from Foster's Market Chocolate Whopper's recipe. Sure! That sounds delicious too! !